A rare find! 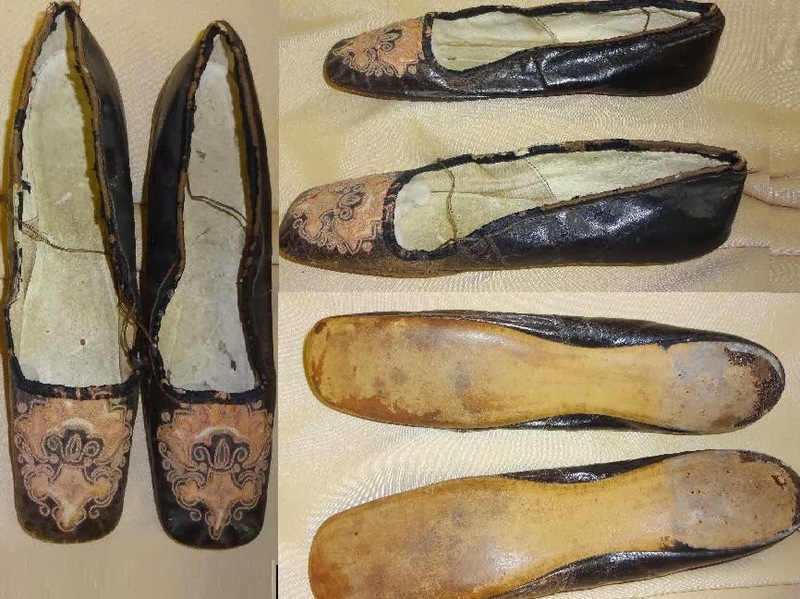 A magnificent pair of original 1830s to 1850s women's fancy dress shoes. 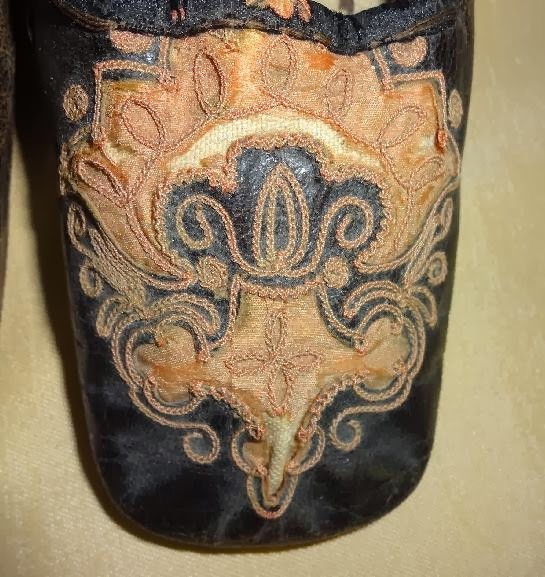 Very dark brown leather broad square toe flats and straights with decorative cutwork vamps that are showing wool fabric inserts (the wool is shattering) and very lovely decorative Rose Pink shaded chain stitching. 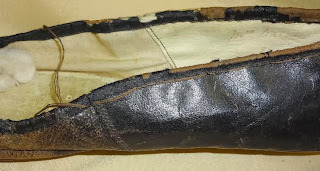 The soles are leather while the inside lining is leather towards the back and heavy twill cotton in front and toes. 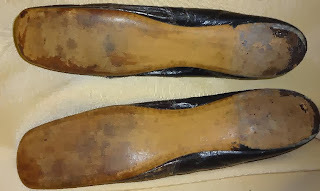 In overall good condition, especially when considering the age; the trim is worn around the tops and and the very fine ankle straps are delicate. I suspect these may have been heels at one time, there is very tiny holes at the heels and possibly glue residue. Measures 8 3/4" long - 2" wide at the toes and 1 3/4" at the heels. This is a superb example of footwear fashion of the Pride and Prejudice era!! First, P&P was earlier than the Romantic era. Also, not fancy dress but regular dance shoes for a ball or evening wear. I do think they are more 1840's so Romantic/early Victorian for these. 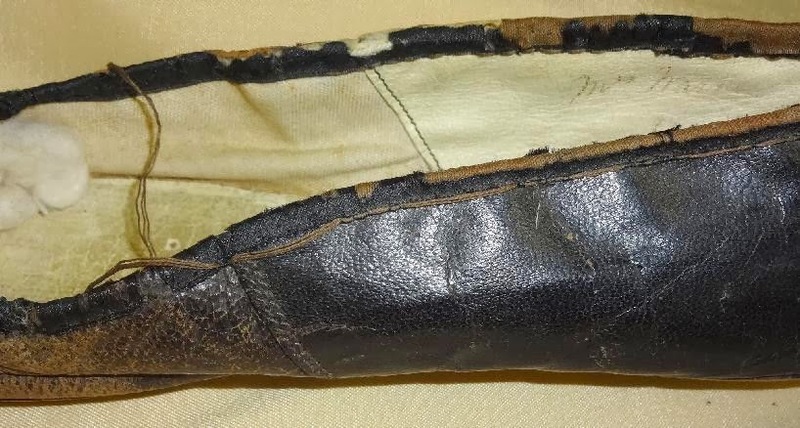 You see square toed shoes well past the American Civil War. 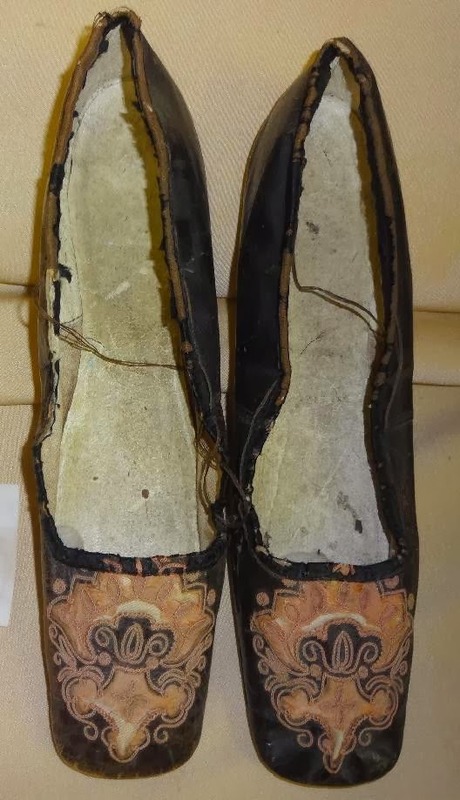 Something of note; pretty much all European/European colonial shoes between eh, the 17th C to about the 1860's were straight last as you see here. Meaning, the did not have a left or right until you put them on your foot. Then, the leather/cloth would stretch to your foot shape creating the left and right foot (ie, you can't switch them like the popular myth. It feels funky). Left and right lasts reappeared (they had them in the middle ages & Renaissance) really in the mid Victorian period but the straight last didn't completely disappear until the 20th C.
I wonder why they switched? I'd have thought straight lasts were a disimprovement. The straight lasts appear with the invention of the heel. 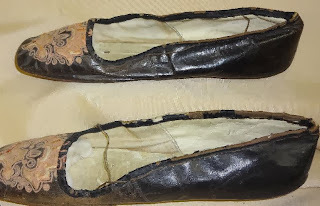 In order to cut down production time (you can spend time shaping the heel or the last) they went to the straight last. This way, you only need one wooden form rather than two to create the shoe as well, so it was economical as well. Once the heel stops being very shapely (stacked heels) and machines start to take their place in factories (sewing machines! ), you see left and rights again.